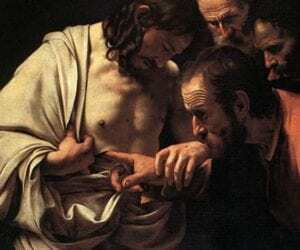 On Thomas, the Resurrection and the interface between faith and science. He is risen! He is still risen! This is the Church season of Easter, the fifty days after Easter Sunday. But no sooner is the celebration of Easter over than we get the story of Thomas, the man who will not believe until he sees for himself. Thomas at first glance looks like a scientist. He needs solid proof. There is certainly nothing wrong with that, and Jesus never chides him for his doubts. But Jesus does bless us, the ones who will come later, and will believe without seeing. The Christian life is a balance of faith and doubt. Christians are called believers; sometimes though there is as much doubt as belief in the mix. Sometimes what we believe is a little murky. The story of Thomas is a window into the life of the Christian. Thomas must have adored Jesus. Jesus seemed to let him down, allowing himself to be killed, not defending himself, even urging Judas on his way. Thomas’ disappointment, fear and anger would have known no bounds. Thomas doubted, we might assume, as much because he was disappointed as because he could not see. For us too, both faith and doubt together contribute to the inwardness that is the Christian life, and that doubt has multiple causes and influences. We go on to try to understand. We do theology, we ask why did Jesus die, how did Jesus save us. Behind it all is the orientation to God and the conviction that Jesus is the image of God in human life, and that that life and love survives death. Christian faith requires an openness to things unseen; faith is oriented around an inner life that questions, interrogates, and embraces a hidden power of love and abundance. Glimpses of this love are evident in Scripture and in nature and in the social and cultural spheres. Christians believe that in the man Jesus this power of love was so concentrated –by the power of the Spirit — that he is known as the Son of God, and that God’s Spirit is immanent in all matter. In all of us the emotional and rational are a complex mix. This is as true of those of us who believe as it is of those who doubt. Because of faith, because we are oriented to God, intellectual issues are raised as we proclaim faith and seek ‘to give an answer for the faith that is in us.’ Theology is a reflection on faith, a rational discourse that involves imagination, logic, rhetoric, hermeneutics, and learning. But faith can never be defined as assent to propositions that can be tested directly, as science is tested. As people of faith we need rational discourse for many reasons. First of all, because the process of reading and understanding Scripture is an ongoing task; the inner life is read by Scripture, and vice versa. It requires hard work to read an ancient text in its context, and in ours. Second, theology keeps us in touch with the wisdom of the Church in previous generations. Third, the inner human psyche is also very self-deceptive. We can believe things that are harmful and dangerous. We can associate God with violence and hatred. We can misuse Scripture and justify evil actions in bad faith. Faith can be tested by reason and dialogue and interrogation of history and science. But we must always distinguish between theology and faith. Fourth, although we never understand fully reason does help us to sort things out within limits. It creates clarifying ponds within a larger uncertainty. And although theology deals in mystery, theology helps us to distinguish between what is contradictory and what is merely paradoxical. For example, I have come to think that compatibilism (we have no free will but we are responsible) is incoherent; but for much of the modern Christian tradition compatibilism has been accepted as reasonable, if mysterious. And there are ways of approaching the problem of evil and biblical interpretation which give us clarity even if we still see ‘as through a glass darkly.’ Similarly, with the boundary between theology and science. Fifth, the theology and science interface is one that contributes to theology by showing that the concepts and images and creativity in one discipline have echoes in the other. Sixth, theology is also a meditation on the divine, and like music and art and indeed mathematics and science, it is done for the sheer joy of awareness; it is a way of glimpsing the divine and the original beauty of the universe. That is why theologians are sometimes frustrated with scientists when they try to do all theology from a theology/science lens alone. Science, in distinction to theology, is primarily oriented to what can be seen and measured. Of course, much of what science measures is invisible to ordinary experience; cells, subatomic pathways, higher dimensions. Science is often mediated by mathematics which has an invisible aspect. And science does include an inner human aspect. This is what the famous philosopher/scientist Michael Polanyi calls ‘personal knowledge,’ the passion and intuition that takes a person into a particular scientific endeavour in the first place. The personal includes the whole intuitive grasp of a discipline that comes from a long indwelling within it over a long period. For many scientists, this indwelling involves awe and wonder. Nevertheless, the primary orientation of science is to what is visible, or what can be made visible, or at least checked in the material world. We don’t get scientific papers very often in which scientists stop to say: this is amazing. The differences between faith and science as ways of being oriented in the world are responsible for some of the difficulties people sometimes have in reconciling the two ways of seeing. On the one hand scientists have problems accepting more subtle ways of knowing, and knowledge that is not inherently falsifiable. Scientists can also try to make faith more like science, more like a set of propositions than it is. People of faith can be suspicious of all rationality because it is often used to attack faith. On the other hand, there is also great overlap. Both faith and science are interested in the nature of what makes us human. Both disciplines are interested in origins and how we came to have the minds we do, including our religious orientation. The South African theologian, J. Wentzel Van Huyssteen talks about ‘transversal dialogue,’ dialogue that does not prematurely reach an agreement or consensus, dialogue that works away at the problems and respects disciplinary differences even while trying to overcome them. The lack of exact fit between the disciplines adds to the tension and interest of the discussion. Theological concepts like the ‘image of God’ are juxtaposed with scientific reflections on what makes us distinct as mammals and primates from other species, and how we are at the same time so similar to these animals, and indeed to all life-forms. These discussions across disciplines can make for some of the most fascinating conversations on the planet, so long as we do not try to achieve premature integration. In other posts I will look more deeply at the problem of evil as I did in my book (Animal Suffering and the Problem of Evil, OUP, 2013), at natural selection and the “New Evolutionary Synthesis”, and at the problem of free will. J. Wentzel van Huyssteen, Alone in the World? Human Uniqueness in Science and Theology. Grand Rapids: Eerdmans, 2004. Michael Polanyi, Personal Knowledge: Toward a Post-critical Philosophy. Chicago: University of Chicago Press, 1958.